TRUTH Council 2018 Gears Up for Another Year of Trans Storytelling! TRUTH, a youth-led program housed at Transgender Law Center and GSA Network, launched a new website (link is external) to build trans youth power through online organizing and storytelling. The website features an interactive storytelling guide (link is external) and advice from other young people who have been thrust into the spotlight; a gallery of stories that youth visiting the site can contribute to; resources created by and for trans youth; and support for allies and families of trans youth. Read Juniperangelica’s story on how TRUTH has helped her feel a sense of community with youth across the country. 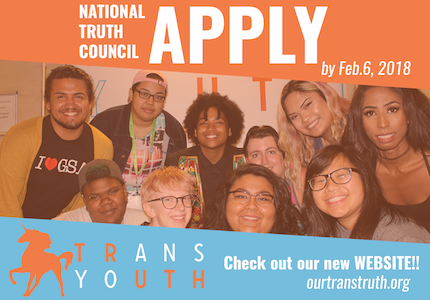 Transgender and gender nonconforming (GNC) youth can apply to join TRUTH by visiting ourtranstruth.org/apply. Trans and GNC youth of color are encouraged to apply! Washington DC (Jan 26) – National Youth Council presented Pushing Forward: The National Trans and Queer Youth movement, a workshop at Creating Change 2018. Atlanta, GA (Jan 15) – Ashe Helm-Hernández, Southeastern Regional Organizer, co-facilitated the Rustin-Lorde Breakfast to kick off the year for social justice work throughout Atlanta. Los Angeles, CA (Jan 9) – Queering Brotherhood fellows spoke to the LA County Board of Supervisors advocating for trans and queer youth in the foster system. Boyle Heights (Feb 3) – Health Happens in Schools General Assembly in SoCal. Southeastern Tour (Feb 2018) – GSA Network Southeast will be visiting our National Association members Center for Artistic Revolution (Little Rock, AR),Magic City Acceptance Center (Birmingham, AL), and BreakOUT (New Orleans, LA) to get a better sense of how the work is going and ways we can support the ever-growing Southeastern GSA Movement.